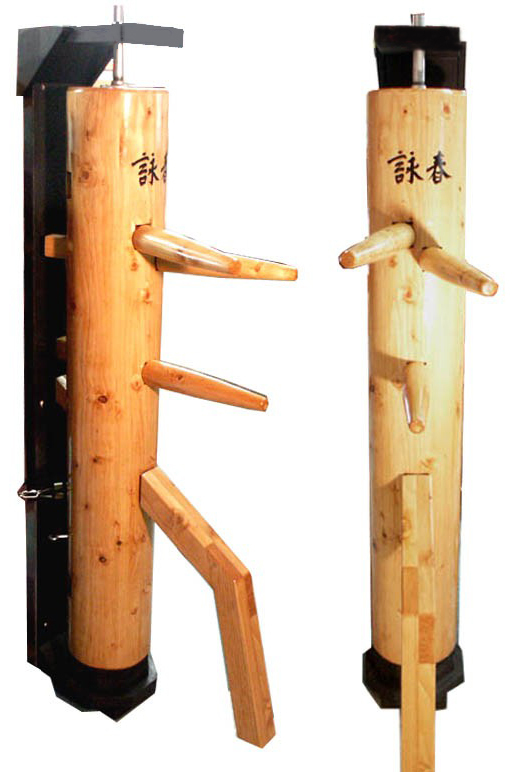 RECOIL REACTION DUMMY STAND IS ONE OF OUR NEWEST AND MOST EXCITING TRAINING TOOLS WE HAVE TO OFFER. 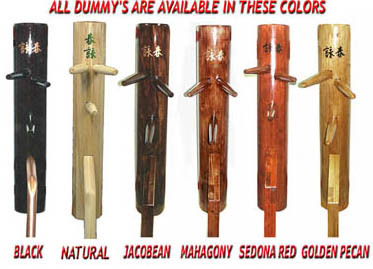 THIS PATENT PENDING DESIGN TAKES YOUR WOODEN DUMMY TRAINING TO THE NEXT LEVEL BY APPLYING TENSION AND RECOIL TO YOUR DUMMY. THIS STAND "RETRO-FITS ALL WOODEN DUMMIES." LITTLE ASSEMBLY IS REQUIRED AND EASILY MOUNTS TO YOUR WALL OR WOODEN POST. THIS IS ALSO A GREAT SPACE SAVING STAND. OUT OF ALL OF OUR JONG STANDS THIS ONE TAKES UP THE LEAST AMOUNT OF ROOM. 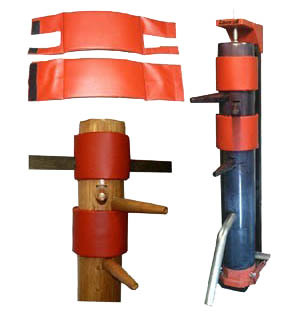 THE WAY THE RECOIL STAND WORKS, IS TWO TENSION BANDS MOUNTED TO THE LOWER SIDES OF YOUR DUMMY, CROSSED OVER IN THE BACK AND MOUNTED TO THE OPPOSITE SIDE OF THE STAND. THIS IS WHAT CREATES THE TENSION NEEDED TO KEEP THE DUMMY FACING FORWARD. 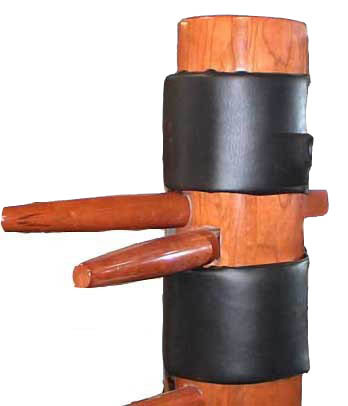 THE DUMMY WHICH SITS ON A SWIVEL BASE CAN PIVIT 90 DEGREES TO THE RIGHT AND LEFT, AND ALWAYS UNDER TENSION. WHEN RELEASED OR YOU CHANGE POSITION THE DUMMY THEN WILL RECOIL BACK TO CENTER POSITION. IT ALWAYS WANTS TO RETURN TO THE CENTER. THE BASE CAN BE LOCKED WITH TWO METAL PINS, IF YOU CHOOSE TO DO THE TRADITIONAL FORMS WICH REQUIRE IT NOT TO ROTATE. WHEN YOU WANT TO FREESTYLE JUST PULL THE PINS AND WATCH YOUR DUMMY COME ALIVE. AS WITH ALL OF OUR STANDS YOU HAVE HEIGHT ADJUSTMENT OF 3 INCH"S FOR MULTIPLE USERS. THE HEIGHT ADJUSTMENT IS ONLY AVAILABLE FOR USE WITH A WARRIOR DUMMY. THE TWO MAIN PRINCIPLES THAT THIS STAND OFFERS YOU IS RECOIL AND REACTION. THE RECOIL IN THAT IT WILL ALWAYS RECOIL BACK TO THE CENTER POSITION AFTER RELEASED. THIS MEANS THE DEFLECTION OF THE ARMS WHEN BLOCKED PROVIDE ENERGY BACK TOWARD YOU AS IN DEFENDING AN ACTUAL STRIKE. THE REACTION PRINCIPLE SIMPLY DEVELOPS FASTER REFLEX'S DUE TO THE FACT THAT "THIS SUCKER HITS YOU BACK." THIS IS AN EXCELLENT TOOL FOR THE SERIOUS PRACTITIONER ,WHO IS LOOKING TO TAKE THERE SKILLS TO THE NEXT LEVEL.